Relay for Energy Flow, optimisation of consumption of own energy, with integrated webserver, IP-connection, zero export device, measuring transducer for power. 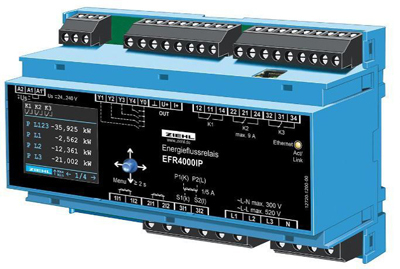 Relays for energy flow EFR4000IP monitor the current flow between public power grid and generating plant/consumer. The operation is made easy via the integrated web server or directly at the device. Measured values are displayed neatly arranged, at the device, on the LCD screen. When the own power plant generates more power than is consumed it is often is more economical to consume the excess energy than export it. This is especially reasonable when the difference is high between the price you pay to the grid provider and the price the provider pays you for fed in energy. The EFR measures the energy flow in all 3 phases and calculates the mean value. If there is sufficient own power left, the EFR4000IP switches on up to three consumers and ensures that the power is consumed in house. This is relatively simple if a PV system feeds uniformly under a clear sky and consumers have loads with constant power consumption, such as heat pumps or heating elements are connected. Particularly suitable are consumers that consume a lot of energy and can be switched frequently, for example, boilers. It becomes more complicated when the generation varies because of clouds covering the sun and consumers that do not continuously draw current, such as washers, dryers, irons or stoves. The analogue output can regulate a consumer stepless and thus achieve a greater rate of own consumption. When using phase angle controls the specifications of the grid providers must be obeyed. Energy flow is always evaluated and displayed via the LCD display. The power purchased from the public grid is shown as positive(import)and the feed in energy reduces the bill and is therefore negative (- sign). The EFR4000IP can optimises the consumption of own energy even under difficult conditions.